This activity gets students forming affirmative and negative commands with reflexive verbs. It's a fun speaking activity as it gets students up and giving commands to each other. This file contains 30 different cards with scenarios on them. Yellow cards require affirmative commands to be formed and blue cards require negative commands. 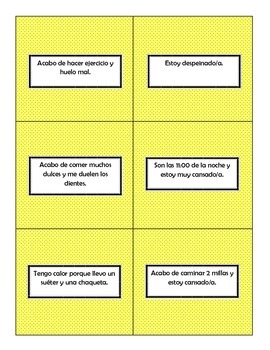 Half of the class should receive a card with a sentence (ex: Acabo de hacer ejercicio y huelo mal.) After reading the cards, students will form commands (ex: ¡Dúchate! ).